In recent months, online forums have seen an uptick in worry about online poker bots – that is, pieces of software that can play automatically and are good enough to beat the games without any human intervention necessary. Virtually all US poker sites are suspected of being affected by botting activity although international sites aren't exempt by any means. Poker bots have been around for more than a decade, but it's only now that fear of them has surged to the forefront of players' minds. Most online poker bots are commercially available programs that are set up with a standard strategy of what to do preflop and postflop depending on the cards received and the board. The user can typically input modifications to these initial parameters or develop entirely new guidelines to improve performance. There are several botting forums where participants post about their experiences and share successful bot profiles with each other. Bots can run continuously, joining and leaving tables according to criteria programmed into them. Despite the fact that they tend to play a predictable game, they're usually good enough to beat the micro-stakes for small but positive winrates. People running bots 24/7, perhaps using multiple machines and accounts, can therefore earn themselves a tidy profit between winnings at the tables, bonuses, rakeback, and other promotional perks. There are bots for cash games, SNGs, and multi-table tournaments. The most popular of these automated software packages focus on NLHE poker, but there are a few that work in PLO games as well. Most other game formats are too sparsely spread to interest the creators of bot programs. Why Are Bots Bad for the Game? Running bots is against the terms and conditions of virtually every internet poker room, and security staff take active steps against them. Bots are bad for the public perception of the game, and many recreational players are convinced that these programs can see their hole cards or cheat in other ways. Although these fears are overblown, bots that cooperate as a team can in fact collude against their human adversaries. Furthermore, bots are bad for game quality. They occupy seats that could be filled by actual players. They siphon off a portion of the money in the poker economy that would otherwise remain in circulation. This is especially true in the case of rake races and leaderboards. Because bots can sit at the tables for far longer sessions than actual players, and they never tilt or get tired, they can achieve high finishes in these promotions and scoop up the cash payouts. Also, they're bad for the atmosphere of the game because they don't chat or interact with the people at their tables. While there has been low-level botting going on at major poker sites for a long time now, we haven't seen any hard evidence that the problem is getting worse. However, threads discussing alleged bot behavior have been popping up at popular poker forums much more often than they had in the past. We believe this to just be a reflection of the growing awareness of bots among the public at large. News stories in mainstream publications claim that social media bots are responsible for everything from influencing the last presidential election to opposing gun control. Russia is believed to be behind many of these nefarious bot conspiracy plots. Even though these types of bots are radically different from the poker bots we're talking about here, once the idea of bots entered the public consciousness, it was almost inevitable that concern about poker bots would increase especially among those who are susceptible to scare tactics. Whenever the topic of poker bots arises, many people are quick to chime in with their suppositions and theories. It's widely believed that the majority of botters are from Eastern Europe and Russia! Russia! Russia! These “facts” are often presented as foregone conclusions without a shred of reasoning or evidence behind them. We decided to do some research on the phenomenon of poker botting with an eye toward shedding some light into where bot accounts originate from. Professional Rakeback has access to data about botting that isn't available to the general public. We must of necessity remain somewhat hush-hush about where we got this information from because the last thing we wish to do is tip off bot users on how they can evade detection. Our careful analysis has yielded some unexpected results. First of all, the leading country of origin for poker bots is Germany with a full 16% of bots hailing from Deutschland. Next on the list is the United Kingdom followed by the United States. This geographic distribution is totally at odds with the locations that are commonly believed to be hotbeds of botting activity. Russia, Ukraine, Slovakia, and other places in that part of the world do have botters that have been caught in the past, but they're much less prevalent than those from the three countries just named above. Here, there are a few former Soviet Bloc cities featured, so charges that there are many poker botters in these regions aren't entirely baseless. Still, Berlin heads the list as we would expect given Germany's evident penchant for this type of wrongdoing. The presence of many botters in Medellin, Colombia may seem unusual at first glance, but we here at ProfRB were not surprised by this fact. We had been privately told before that Medellin was a center of all kinds of online poker fraud from account sharing to tournament ghosting and trickery at the affiliate end of things. Thus, we weren't shocked to discover that it was home to a sizeable contingent of poker botters too. How Do the Sites Combat Bots? Online poker sites employ sophisticated automated tools as well as trained personnel to identify and ban bots. The exact techniques used aren't publicly disclosed because doing so would give bot developers clues as to how to circumvent them. The measures taken likely include watching for suspicious patterns of play, like sessions lasting 24 hours or longer and weird bet sizing, monitoring users' running processes to see if they contain known bot executables, and lurking botting forums to get the scoop of the latest in bot algorithms. In many cases, individuals operating bots are violating other aspects of the terms of service at the same time. For instance, bot networks that communicate with each other are breaking the anti-collusion rules. People maintaining multiple bots at the same site are typically multi-accounting and probably using VPNs as well. Therefore, there are several ways for the sites to catch them out even without positively determining that bots are being used. Despite all these avenues at the poker sites' disposal, feedback from regular players is critical. Simply put, there are too many tables active at one time for poker rooms to analyze every hand as it's being played. Therefore, they rely on reports of suspicious activity from regular users. If you believe that you've spotted a bot in your games, the best thing to do is to bring the matter to the attention of support. They'll forward the information to the relevant department, and they may initiate an investigation. At the Winning Poker Network, for instance, you can report suspected bots with a form on the network's website. Once a bot is discovered, the standard way of proceeding is for the site to ban the account and confiscate all funds. Sometimes, a site will wait until it can nab multiple bots at once and descend upon them all in one fell swoop. This prevents botters from subtly changing their algorithms and seating protocols once one of them is caught in order to evade detection in the future. Customers who have played against bots that have been barred by the site sometimes see refunds applied to their account balances based upon the number of hands they played with the bots and the blind levels/buyins of these games. It some ways, the battle between botters and site management is a game of cat and mouse with each side attempting to thwart the steps taken by the other. Internet poker rooms are always trying to come up with more sophisticated ways to detect and eliminate bots. The Winning Poker Network routinely displays Captchas for high-volume players to solve. The distorted and multicolored words featured in these tests are difficult for computers to parse correctly, and so they serve as a means of distinguishing real players from bots. The network is working on a system that would allow ordinary players to send Captcha requests to other users with the click of a button, allowing them to challenge those whom they feel might be bots. At BetOnline.ag, we pride ourselves on providing our players with a trusted and reliable online poker experience that delivers exceptional customer service. In return, we expect fair and ethical play from our players. We take the security and safety of our players seriously, and we will not stand for cheating or fraud of any kind on our network. Let us be clear that players found colluding, chip dumping, deal-making, multiple accounting, using prohibited software and bots, or doing anything that we believe compromises the fairness of play or game security at BetOnline.ag will not be tolerated. Any player that our security and fraud team find guilty of acting in an unethical manner and in a way that generally violates our Fair Play policy will have their account closed, account funds confiscated, and subsequently will be banned from playing at BetOnline.ag along with all other sites on our network. Our zero tolerance policies are to the benefit of all customers, who can continue to enjoy playing online poker at BetOnline.ag confident that our high standards ensure vigilance when it comes to maintaining game integrity and a service that they can trust and depend on. Rapid progress in technology, especially in the world of computing, has led to growing worry that the day may come when bots can crush high-stakes games and beat even the best human players. The recent defeat of a team of human poker pros by the AI Libratus does little to assuage these fears. Yet, we must remember that even as bots become tougher and more competent, tools for counteracting them are also proliferating and becoming more mature. 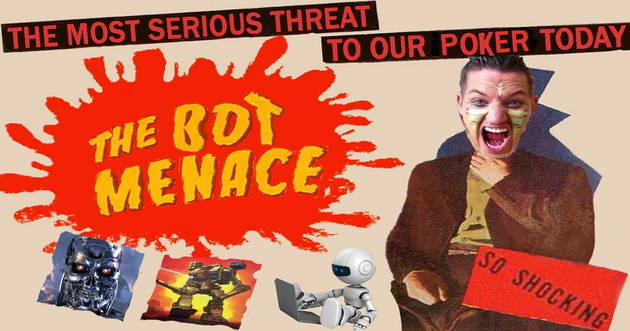 Our diagnosis is that bots don't pose a serious threat to the integrity of most online poker games at present and are unlikely to do so in the immediate future. Nevertheless, you'll probably find yourself facing them occasionally, depending on the sites you play at and your preferred stake levels, so it's important to remain vigilant and be ready to report any unusual player activity to the appropriate security departments of the poker rooms as necessary.